“I did not arrive at Emory planning to be a musicologist, but the mentoring I received opened my eyes to a field I knew nothing about and opportunities for study that I could not even imagine." — Sam Budnyk 17C, who will pursue a PhD in musicology as a Knight-Hennessy Scholar at Stanford. Recent Emory alumnus Sam Budnyk 17C has been selected for the second cohort of the Knight-Hennessy Scholars program at Stanford University, a highly competitive international program that fully funds graduate study at Stanford. Budnyk, the first Emory student or alum to be selected for the program, was among 68 scholars selected from 20 countries around the globe. He plans to pursue a doctorate in musicology at the Stanford School of Humanities and Sciences. He earned a bachelor’s degree in music and comparative literature from Emory University’s College of Arts and Sciences and will complete a master’s degree in musicology from the University of Oxford in June. independence of thought, purposeful leadership and a civic mindset. “I appreciate the opportunity to collaborate with such a diverse group of ambitious change-makers. I look forward to the opportunity to learn and grow — thanks both to my peers in the Knight-Hennessy Scholars program and to the world-class faculty at Stanford,” Budnyk says. “The buzz of the forward-thinking, Silicon Valley-style mindset is in the air and I am excited to participate in that and hopefully broaden the horizons for academic publishing and cultural criticism in this dynamic time." Building on his extensive undergraduate work in music history, composition, languages and literature, Budnyk has spent the last two years in England at Oxford studying musicology in preparation for doctoral-level work. 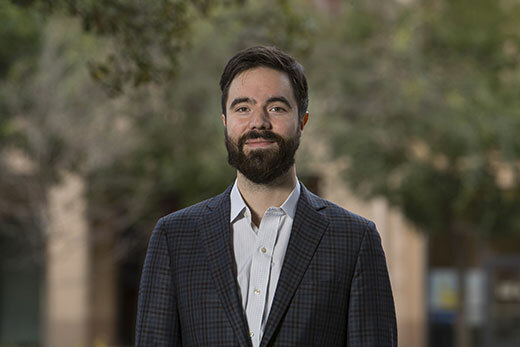 He is also at work on an interdisciplinary, open-source journal designed to make humanities research more accessible to the general public that he hopes to bring to Stanford next fall. "The support I received from my academic departments at Emory, both in music and comparative literature, was exceptional. Faculty members encouraged me to explore my interests and freely gave their time to support this,” Budnyk says. “I did not arrive at Emory planning to be a musicologist, but the mentoring I received opened my eyes to a field I knew nothing about and opportunities for study that I could not even imagine." Emory College professors Peter Höyng (German studies), Garth Tissol (classics) and Kristin Wendland (music) were especially influential, he says, and gave him opportunities for independent study and research that influence his scholarship today. "I did not fully appreciate the opportunities I had at Emory scholastically and in terms of extracurriculars until I arrived at Oxford. The chance to seek out what makes you excited as a thinker and try out courses in many different top-quality departments is something special that many students elsewhere will not get to experience,” he says. Budnyk, a native of Fort Walton Beach, Florida, entered Emory as part of the Emory Scholars Program. He auditioned and was selected as a Dean’s Music Scholar, a prestigious designation given to four students in each class. He served as the principal bassist for the Emory Symphony Orchestra starting in his sophomore year, and as a junior he was selected as the Department of Music’s Stipe Society Scholar, an honor that recognizes a student with the best academic and artistic performance and leadership in each arts discipline and requires a commitment to increase arts outreach on Emory’s campus and in the local community. He also received the Charles Elias Shepard Scholarship for Graduate Study while at Emory. In addition to his leadership in music and the arts, Budnyk committed much of his energy at Emory to the campus newspaper, the Emory Wheel, beginning as a writer and serving in several editorial positions before being promoted to Managing Editor in his junior year. “As he did during his four years on the Emory campus, Sam Budnyk will continue to be extraordinary ambassador for the arts and humanities with his selection as a Knight-Hennessy Scholar,” says Michael Elliott, dean of Emory College of Arts and Sciences. At Oxford, he was elected chair of the Music Faculty Graduate Joint Consultative Committee and currently serves as Graduate Humanities Divisional Representative and a voting member of the Oxford Student Union Student Council. He has studied French, German, Greek, Italian, Latin and Spanish languages, and participates in blind wine tasting competitions. As part of the program, Knight-Hennessy Scholars also participate in experiential learning through the King Global Leadership Program, which provides a collection of community experiences, workshops, meetings with leaders, global study trips and personal development opportunities. “We are impressed and humbled by what this new cohort of scholars has already achieved and inspired by their deeply rooted commitment to effect positive and lasting change in the world,” says John L. Hennessy, the Shriram Family Director of the Knight-Hennessy Scholars program. The program, announced in 2016, is named for Hennessy, chairman of Alphabet Inc. and president of Stanford from 2000 to 2016, and Phil Knight, MBA ’62, philanthropist and co-founder of Nike Inc. The program plans to increase the annual intake of scholars to 100 in coming years.